Air conditioning brings comfort to a home. So, if you are evaluating your air conditioning unit, the very first question you need to ask is – are you comfortable? Air conditioning units do not last for eternity. Its average lifespan is around 12 years. And many homeowners will tell you that their air conditioning unit failed them at a time they need it the most. Fortunately, not all system malfunction leads to a huge disaster. Most issues are cheap and quick to fix and you will be kicking yourself for not addressing air conditioner repair Florence SC much sooner. The first warning sign is when your air conditioning unit will not turn on. In most cases, the most likely reason behind it is simple to fix. It may be due to the thermostat not being set properly or when the power is not reaching the air conditioning unit. Fixing it will require you to make sure that the unit’s thermostat is set to AC or cool. You should ensure that the temperature setting is accurate. The batter should also be fresh and there should be no tripped fuse in the circuit breaker. Airflow is always important if you consider your comfort level. In case you are no longer comfortable, the problem may be related to airflow. The first thing you can do is fix the filter. This needs to be done as part of a regular HVAC maintenance routine. Depending on the filter’s quality, and the number of people staying in your home and if you have pets, the filter might need to be changed more regularly. Outside your house, please be sure that there is a minimum of 24 inches of clearances on its sides and at least 5 feet above the air conditioning unit. Additionally, make perfectly sure that there isn’t any obstruction to the cold air returns as well as registers to the home. An abnormally high utility bill may be due to your air conditioning unit working inefficiently. Following a dirty filter, the most likely cause of this problem is a chocked condensing coil. The coil, which is located with the unit outdoors, it has numerous cooling fins, just like a car radiator, that can collect dust as well as debris. 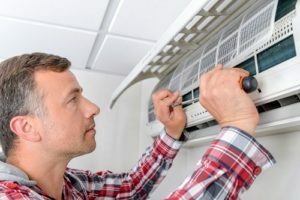 Don’t forget to call an air conditioning repair and maintenance professional if your unit needs a tune-up. The possible cause of the weird noises like ticking, buzzing, or rattling might just be a bit more than just a loose screw. However, it can also be caused by a bent fan blade on the outdoor unit or a bum blower motor on the indoor unit. If you are lucky enough, the problem may be fixed by a simple tightening or lubricating. If not, you may need to replace the fan motor or blade. If you are not sure, you can always hire an air conditioner repair Florence SC specialist. Call Florence HVAC Experts if you need help with your air conditioning unit.